BREAKING! Obama on cover of gay magazine! NEW YORK CITY 11/11/15 – In the just published gay magazine, OUT, the face of Barack Hussein Obama dominates the cover that will be seen on newsstands all over the world, making LGBTQ history. This is not a made-up story. Obama eagerly consented to be interviewed and posed for the cover photo. He is the first president in history to have his portrait and story featured in a sodomite magazine, bringing embarrassment to the United States as well as being a source of ridicule for countries around the world. Actually, however, he is not a legitimate president. He is an usurper who was, by deception, forced into the White House by heavily documented voter fraud, all sponsored and pushed by The Communist Party USA (CPUSA), that managed to block every piece of information about him including his birthplace, (which was in Kenya – we've seen the ACTUAL birth certificate), and his college and university records, meaning registration, grades, his instructors and his activities. We do know that he came to an American University under "Foreign Student" classification. 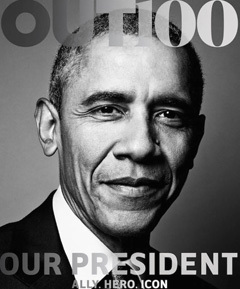 The homosexual magazine has Oscared Obama as OUT's "Ally of the Year." Unlike the Nobel Peace Prize famously awarded him, THIS is one title Obama has definitely earned. Obama has tried to hide his homosexual drive, but, as he told David Axelrod, "I'm just not very good at bullsh--ing." There have been many speculations that Obama is a homosexual and even that Michelle is a transsexual who was born as Michael, a name Obama let slip during a national TV interview which we saw and heard. As for Michelle, you can Google the name Michelle Robinson, then Google the name MICHAEL Robinson. You will be startled. Obama, the imposter in the White House is not only leading the United States to destruction from within and without, but with his hatred of God and morality, he is also passionately leading everyone who buys into his policies down the road to hell. Our thanks to journalist Douglas Ernst of World Net Daily who first caught this.